With our years of expertise and knowledge in domain, we are offering a large range of Classical Guitar. The Classical Guitar of our company functions freely without any interruption. The strings of guitar does not harm fingers and known for their durability. 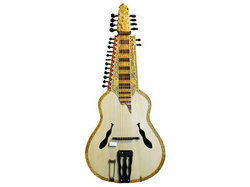 Description :22 strings solid neck, made of ply , Specially designed custom made without gourd. Students Models are made for the Students requirement, good sound but for students only. Technical specifications:F hole semi arch top, front chi Kari, side resonating strings. - Side and Back: made of Teak Ply. Our company has created a niche in the field of offering Wooden Guitar. Owing to the rich industrial experience and expertise in this business, we are involved in providing supreme quality array of Classical Guitar. We offer Wooden Guitar. We engrave these stands from premium grade wood, that enhance their durability to a large extent. Further, perfect polish and excellent finish make them first choice of musicians. We are affianced in offering wide assortment of Decorative Wooden Guitar. We are reckoned firm actively involved in providing a wide series of Classical Guitar. Owing to the best quality and robust structure, these are enormously admired in the market. Original Hobner F Cut Medium body semi Acoustic guitar with free original cover. Sealed pack.